My first physical contact with Annmarie Skin Care (ASC) was through its sample kit which I bought some time at the end of 2017. I bought it after taking the Annmarie Skin Care Skin IQ Quiz, which only had 10 quick questions. Based on the Quiz and its recommendation, I bought the Balance Sample Kit which consisted of refreshing Aloe Herb Cleanser and glorious Herbal Facial Oil. At the risk of sounding snobbish, I am very selective in terms of skincare products. Even during my youth, I have used only a few brands. Not much of a shopper, actually. But when I turned 40, I began to seriously put more thought into my product choices, preferring those with organic or natural ingredients. This blog was started to share my learning process, among other things. Even when I was a housewife with very limited budget, I bought natural products such as Human Nature and Claire Organics. Of course, I am not a purist. Now and then, I do indulge in conventional products because some are pretty amazing and fun, such as the cosmetics. The thing is, I am also quite loyal to brands. So, although I truly love Annmarie Skin Care samples, I was initially reluctant to switch to ASC because I was attached to Miessence. There are many perks to being an independent representative of Miessence, as well as some downsides. One of the downsides is the requirement to make regular purchases of Miessence products. That was ok at first, but when Miessence products was regularly ‘out of stock’, including those that I wanted, I had to move on. I didn’t feel like purchasing something that I don’t really need nor want. Miessence is currently in the midst of a transition period, I may revisit them once the issues are settled. Aside from that, I get to become part of an exclusive community that enjoy exciting benefits such as sharing of beauty info, being the first to test ASC’s new products, receive samples of natural and organic products from other companies, etc. Would you like to be part of Annmarie Skin Care Tribe Insider? The switch took some time. Firstly, I reassessed my skincare needs and re-took the Annmarie Skin Care Skin IQ Quiz. I was a bit concerned that my age, diet and lifestyle may have changed my skin type and needs. But no, the test still resulted in Balance Sample Kit for me. So, I re-ordered ASC sample kit. I needed to make sure that my skin still loves them. When I used the samples, they really made my skin feel good! And I find that I really, really adore the Herbal Facial oil, even more than before. Therefore, I decided to slowly incorporate ASC into my skincare regiment, while finishing the remainder of my Miessence skin care items. No sense in wasting good products, right? The Sample Kit cost USD10 (inclusive of postage) which means it is actually free. As you know, postage to Malaysia from US is at least that much! In addition, I also received a discount code of USD10 for purchase of any regular-sized items, plus ASC’s ‘Toxic Free Home Guide’ e-book which is valued at USD24.95, FOR FREE. 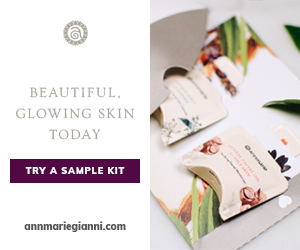 When I ordered the first sample kit, I received ‘Skin Detox’ e-book, also valued at $24.95. I loved that book, very enlightening. The Quiz, although very simple, really brought clarity and put things into perspective for me. It emphasizes the importance of a holistic approach to beauty – lifestyle, diet, etc. Due to that fact, our skin score can change throughout our life because it is linked to two factors that we are within our control – healthy habits and our skincare routine. Some time later, I took another test to find out the essential oil (EO) that matches my personality, and bought myself one of ASC Pure EO Signature Blends sample packs. My favourite EO blend in that pack is Vibrance. I also subscribed to ASC and now enjoying regular emails on promos, discounts, DIY beauty tips and recommendations. I received ASC e-book Skin Detox – A 21-Day Jumpstart to Radically Beautiful Skin last year, and find it very informative. Skin Detox, is a guide to improving our daily routines that will result in a radically beautiful skin, among other things. It will change the way you think about beauty. ASC Team believe that our skin is a reflection of what’s going on inside of us. That our digestive distress, late nights, and even our emotions can affect our complexion. As such, ASC encourage us to care for our skin, body, mind and spirit. The Skin Detox shows us how to get bright, glowing skin and improve the health and beauty of our mind, body, and skin. It’s amazingly parallel to my thoughts when I started Skincare Terbaik 4 years ago – to promote overall beauty – healthy and happy skin, body, mind and spirit. I still believe that that’s the best way to enjoy the golden years ahead. Although ‘Skin Detox’ is more than 100 pages long and covers a 21-day plan, it is confident that even if the only thing we follow in the guide is the meditation program, we’d still walk away feeling and looking better. In it, we will get suggestions on foods to avoid and awesome recipes that we might want to try out. We’ll also learn the real reason alcohol dehydrates us, and how sugar ages our skin. And if we totally follow the guide, we can look forward to improvements in our sleep cycle, our wrinkles fade a little, our breakouts clear up, and we will feel more energetic. In my opinion, Skin Detox is a testament to ASC’s genuine efforts to assist us unleash a more radiant skin, healthier body, mind and spirit. Launched in 2009, ASC started with just 5 products and eventually a full line of all-organic and wild-crafted skincare items. Each product is made using their 3-step proprietary ‘Honest. Wild. Beautiful.’ process. That means all ingredients are hand-selected, then infused into the base oils and aloe juice, and finally crafted with additional plant extracts and ingredients to make them as effective as possible. Their aim is to help us achieve a beautiful, glowing skin. Interested to read the Skin Detox? Please leave a comment below and I will tell you how to get your hand on it. But first, take the Skin Type Quiz and know your skin type. For more info on ASC, please read my previous post. Aloe Herb Cleanser – I squeeze a tiny amount of the Aloe-Herb Cleanser and gently massage on damp face, then rinse. I like the refreshing citrusy scent and enjoy taking my own sweet time doing this ritual. It’s also effective to remove light make-up such as eyeliner and foundation. Herbal Facial Oil for Normal & Combination Skin – the scent is heavenly. After cleansing, I dab tiny drops of the Herbal Facial Oil on my nose, chin, cheeks and forehead, and blend. Although it’s oil, it doesn’t feel oily nor clogging. Never thought oil would make a good moisturiser, but this one is amazing! As usual, I like to scrutinize the ingredients. *Aloe barbadensis (aloe vera) leaf juice, *Cocos nucifera (coconut) oil, [Sodium lauryl glucose carboxylate, Lauryl glucoside (saponified oils of coconut oil and plant starches/sugars)], Herb-infused aloe vera juice [*Aloe barbadensis (aloe vera) leaf juice, *Calendula officinalis (calendula) flower extract, *Hyssopus officinalis (hyssop) extract, *Lavandula angustifolia (lavender) flower extract, *Melissa officinalis (lemon balm) leaf extract, *Helichrysum arenarium (life everlasting) flower extract, *Azadirachta indica (neem) leaf extract, *Olea europaea (olive) leaf extract], *Glycerin (vegetable derived), Populus tremuloides (aspen) bark extract, Essential oils [Citrus paradisi (ruby grapefruit), Citrus limon (lemon), Citrus reticulata (green mandarin)], Xanthan gum (wood pulp derived), CO2 extract [*Rosmarinus officinalis (rosemary)]. Herb-infused oil [*Vitis vinifera (grape) seed oil, *Calendula officinalis (calendula) flower extract, *Symphytum officinale (comfrey) leaf extract, *Symphytum officinale (comfrey) root extract, *Echinacea purpurea (echinacea) extract, *Ginkgo biloba (gingko) leaf extract, *Lycium chinense (goji berry) fruit extract, *Centella asiatica (gotu kola) leaf extract, *Hibiscus sabdariffa (hibiscus) flower extract, *Lavandula angustifolia (lavender) flower extract, *Melissa officinalis (lemon balm) leaf extract, *Glycyrrhiza glabra (licorice) root extract, *Helichrysum arenarium (life everlasting) flower extract, *Nelumbo nucifera (lotus) stamen extract, *Plantago lanceolata (plantain) leaf extract, *Rhodiola rosea (rhodiola) root extract, *Aspalathus linearnis (rooibos) leaf extract, *Rosa centifolia (rose) flower extract, *Rosmarinus officinalis (rosemary) extract, *Camellia sinesis (green tea) leaf extract, *Equisetum arvense (horsetail) leaf extract, *Viola tricolor (violet) extract, *Euterpe oleracea (acai) fruit extract, *Emblica officinalis (amla) fruit extract, *Withania somnifera (ashwagandha) root extract, *Boswellia serrata (frankincense) extract, *Silybum marianum (milk thistle) seed extract], *Caprylic/Capric triglyceride (fractionated coconut oil), *Helianthus annuus (sunflower) seed oil, *Olea europaea (olive) fruit oil, Aloe vera oil [*Caprylic/Capric triglyceride (fractionated coconut oil), *Cocos nucifera (coconut) oil, *Aloe barbadensis (aloe vera) leaf extract], *Passiflora edulis (passion fruit) seed oil, *Daucus carota sativa (carrot) seed oil, *Calophyllum tacamahaca (tamanu) seed oil, Tocopherol (non-GMO vitamin E), Rubus idaeus (raspberry) seed oil, *Mauritia flexuosa (buriti) fruit oil, Vaccinium macrocarpon (cranberry) seed oil, CO2 extracts [Oenothera biennis (evening primrose), Hippophae rhamnoides (sea buckthorn berry), Rosa rubginosa (rosehip), Calendula officinalis (calendula), *Rosmarinus officinalis (rosemary)], Essential oils [Citrus aurantium bergamia (bergamot), Chamomilla recutita (blue chamomile), Melissa officinalis (melissa), Santalum album (sandalwood), *Jasminum sambatimec (jasmine sambac absolute)]. Imagine if we make it ourselves, in our own home kitchen, how much would it all costs? Pretty costly, I’m sure. Hence, ASC’s products are worth every penny. Some users complain that the samples are too little to use. I, and most other users, disagree. I used them sparingly and thoroughly for more than 3 days, morning and night. The purpose is to ensure that they would not have any adverse effects when applied or cause any allergic reaction. Not many companies would make the effort to provide samples for their customers. One more reason why I love ASC. Since then, I have bought the Balance Travel Kit which is a story for another time. It’s among my collection of precious and beloved skincare items. I would really urge all ladies to give themselves a chance to benefit from the wonderfully potent ingredients of ASC’s brilliant products. Take the Skin IQ Quiz HERE and get your score. Thank you so much for doing the impressive job here on SKINCARETERBAIK Web. I particularly agree with your points about Annmarie Skin Care Skin Iq Quiz. Very ingenious.